Click any picture below to see it more clearly! 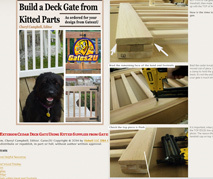 Gate kits are ideal for contractors or for Do-it-yourselfers with previous experience in basic woodwork, such as installing molding or assembling cabinetry. Each kit has the parts for the gate designed by you on our Design Your Gate page. Your kit is customized just for you! If you buy a kit, you should have access to a drill, screwdriver, and 18G brad gun. We recommend a pneumatic bradder, but an electric one is sufficient. Must have capacity to use 5/8", 1" and 1 1/4" brads. Kits contain all parts and complete instructions. 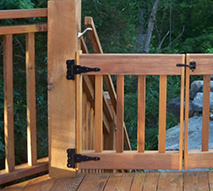 You provide any deck gate hardware, finishing materials and tools, such as sandpaper, stain, and sanders. 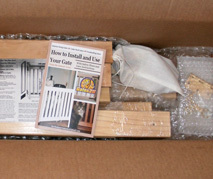 Deck gate kits are sold unfinished for you to seal with Olympic Waterguard for Wood. Parts are cut, sanded, and cushioned in bubble wrap. 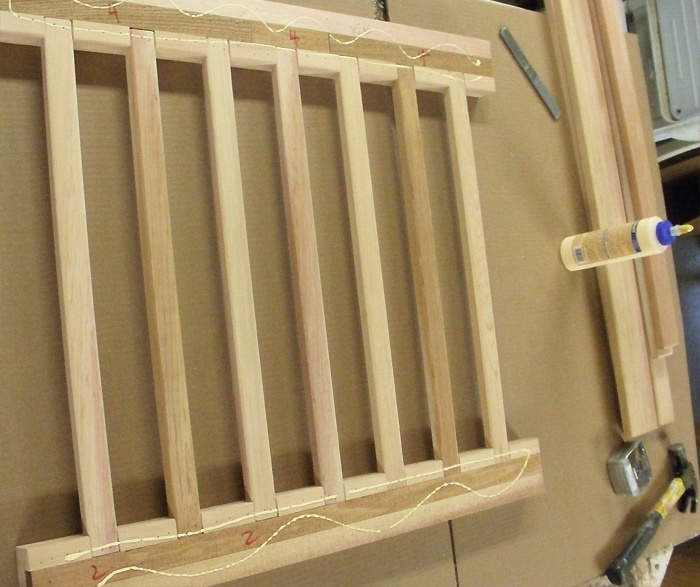 Like parts, such as slats, are wrapped together. Brads and screws needed for assembly are in a hardware pouch. You provide wood glue (optional for reinforcement). 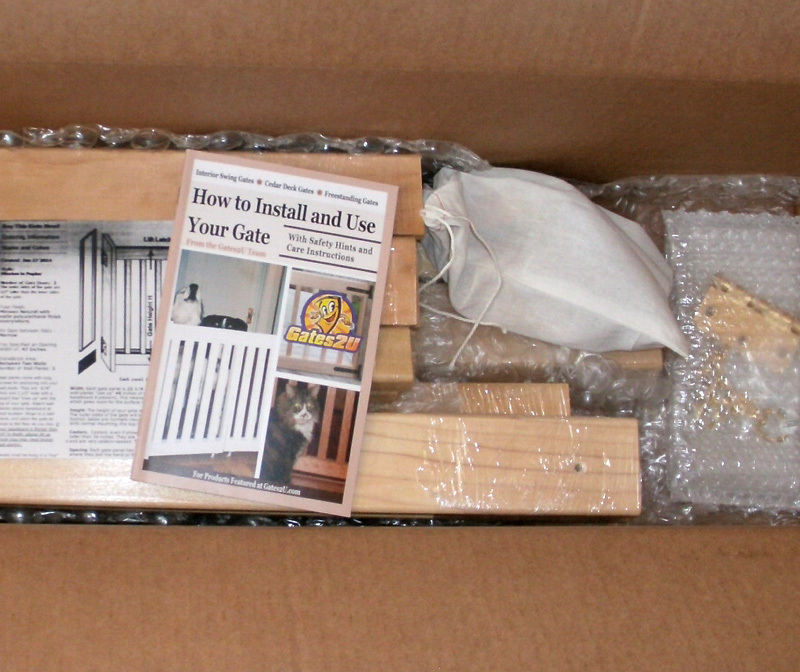 The gate comes with an installation manual in the box and online. When your gate ships, you will receive a PERSONALIZED online manual, tailored to your specific design. It will tell you what is in your kit, and include diagrams unique to your gate, plus plenty of construction photos. A printed manual will be in the box. Your manual has numerous illustrations showing how to lay out the parts, and build up the gate from the front to back. 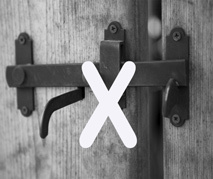 We include all instructions for hanging your gate with strap hinges that you buy, plus additional safety tips for using a gate around the elderly or smaller children or pets. We also provide information on the best way to finish your gate (if you choose to stain it), to include wood conditioning, staining or painting, and sealant coats. 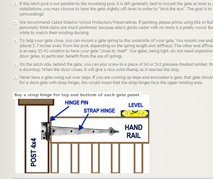 For deck gates, we generally just recommend you apply a waterseal coat upon completion. Deck gate kits come with NO hardware, but recommendations are provided for hardware available at your local big box store. 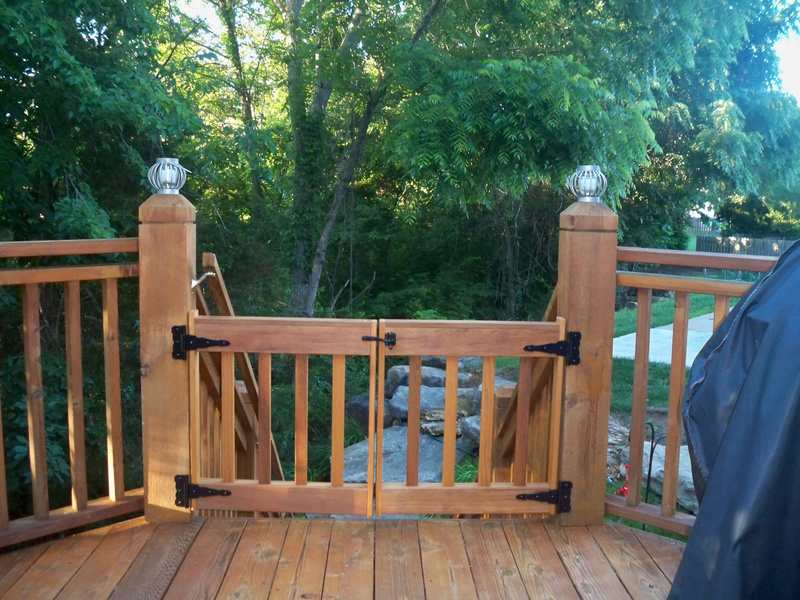 For deck gates, we recommend strap hinges be procured that are at least 20% the width of your deck gate, to ensure proper support. 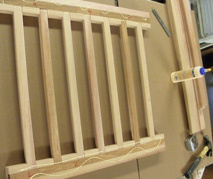 Once you gain the knowledge from assembling your first gate, future gates will go much faster! And you can always reuse the instructions. Order parts from us, or pull out your miter and table saw, and cut parts yourself! We recommend semi-transparent or sheer stains which preserve the wood's beauty. 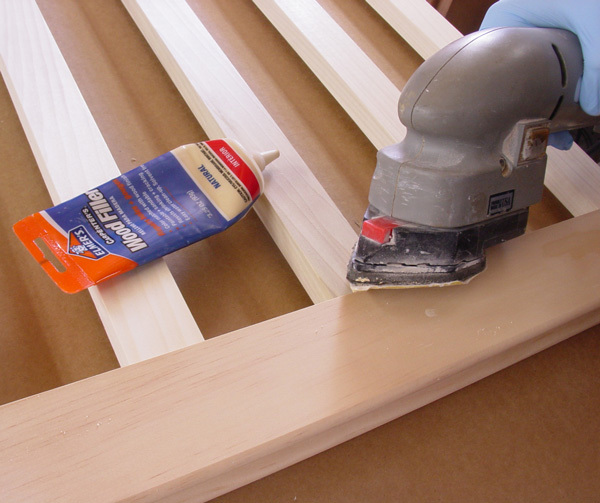 If painting, use a primer before applying exterior grade paint. 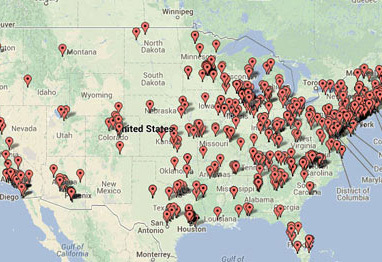 We ship UPS nationwide. 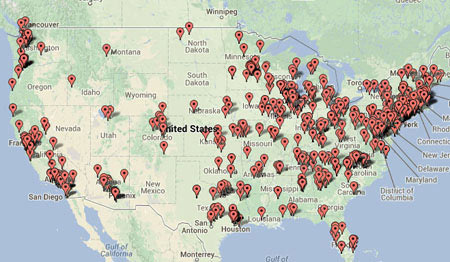 Current turn-around times (10 days or less) are shown on our Design Your Gate page. You need to start there to design the gate, and then you can procure the kit at the end of the design process. The Opening. There should be no obstacles in the gate opening. Make sure there are no objects to hit when the gate swings. 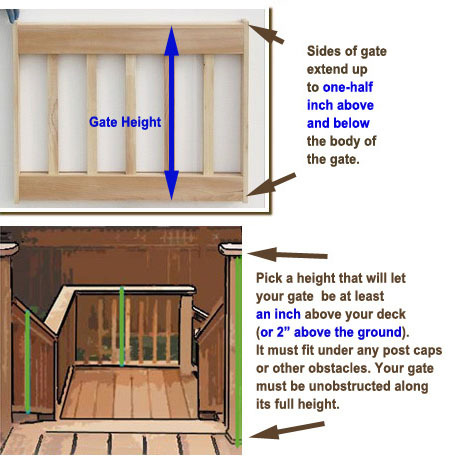 The opening's width at the top should be within 1/2" of the width at the bottom, or your gate will hang really funny because your gate posts are a bit tilted! For a One Panel Gate. 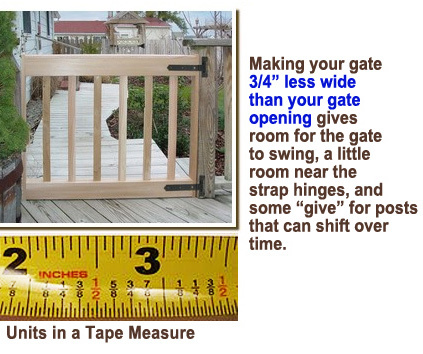 Order a gate 3/4" less wide than the opening, and make sure to measure where the opening is tightest. For the height, make sure you can clear the ground or floor by 1-2",and that your gate can fit under any post caps, if they exist. For a Two panel Gate. Make sure that the width of the two panels, when added together, are 1" less wide than the opening. You need these tolerances for your hinges, for your panels to swing, and for any slight tilting that may occur in the gate posts over time. Gate Height and Gate Sides. 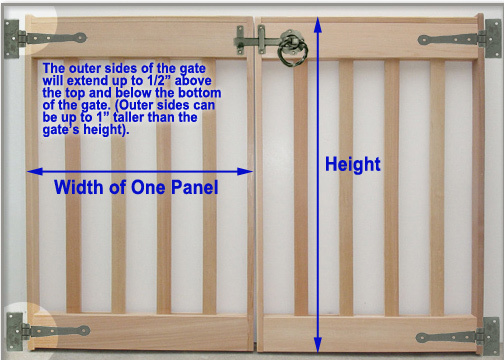 Take into account that the sides of the gate will be 1" longer than the height of the gate that you buy. Height is measured from the bottom of the footrail to top of the handrail. Solid posts. 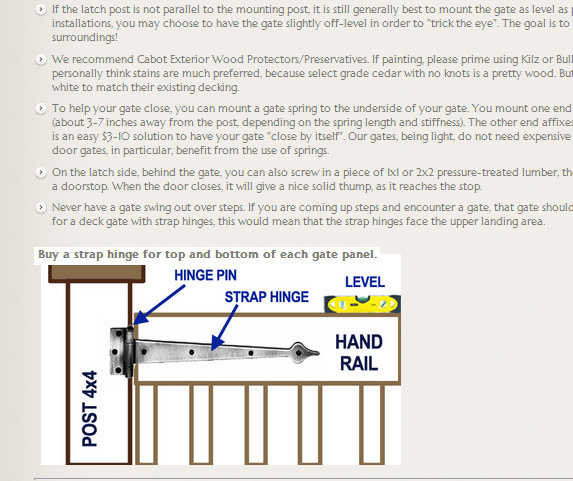 Gates must hinge to a 4x4 post or to a similar structure that is well-anchored into the ground or deck. We recommend a 4x4 because the strap hinge needs a surface a few inches across for the base of the hinge. Click +1 to tell Google this is useful! Need guidance on child safety features? In general, air gaps should be under 3 inches. More information at Consumer Reports Buying Guide.